Today American Garage Door in Denver offers four important considerations for garage doors with windows. These ideas are to help our customers decide whether having windows in their garage door is a good fit for their needs and whether it will even fit with the style of their home. The first thing to do when considering adding windows to your garage door is to ask yourself why. If you currently have no windows in your garage walls and you want to brighten the interior of your garage with natural light, windows in the door is an excellent way to do that. However, if you want to maintain energy efficiency in your garage to the maximum, it might be better to go without windows. You can also opt for something in between. Want light but keep privacy? You can install windows just in the very top section of your door. When choosing windows for your garage door, you want ones that will last the life of your garage door at the very least. Make sure you carefully choose a suitable material for the frame like a fade-resistant polypropylene. You can also opt for windows made with real glass. While acrylic is sometimes used, it scratches easily and deters from the beauty of your door, especially if you’ve decided to invest in a beautiful, custom wood garage door. You can then decide on double-pane glass or single. Double-pane offers energy efficiency and reduced street noise, which can be helpful if you also use your garage as a workshop, craft space or “man cave”. There is a myriad of styles and colors to choose from so you can and should choose windows that coordinate with your front door and the rest of your home. This is where you get to be creative and add value to your home by upping the curb appeal of your residential garage door. As we mentioned earlier, if you are concerned about privacy you can even choose frosted or tinted glass to make it more difficult for would-be thieves to see what you have in your garage. Of course, nobody likes to have to think about money, but adding windows to your garage door is an extra expense. Look at your options carefully and decide if the added dollars are worth it for what you will be getting. Keep resale in mind here because that is a potential area where you could recoup a little cash down the road. Here at American Garage Door in Denver, we’ve been building our business and our experience for the last 35 years. As you can imagine, we can help you with every step of the decision-making process, including going over all the considerations for garage doors with windows with you. Of course, we can perform a quick and efficient installation along with ongoing garage door service. Trust us to help with all your garage door needs, and we guarantee that you won’t be disappointed! 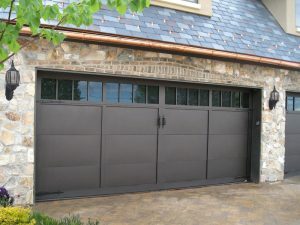 Previous Post 4 Types of Garage Door Styles Next Post Thinking About Replacing Your Garage Door?